In last week’s webinar “Incorporating Value in Your Stage Gate Process”, Dr. John Hogan of Value Management Advisors discussed his value-based framework for improving product development processes. 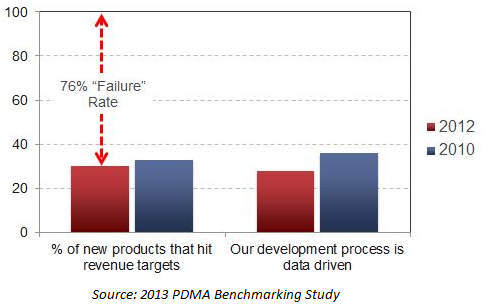 Of course, no process can guarantee success, but the problem is stark: as seen in the chart below, based on evidence from PDMA’s new benchmark study, 76% of all new product launches fail to meet their revenue targets. Data: In each stage of the process, product managers are collecting data about customers, competitors, and their own products. Companies gather voice of the customer data, but they often collect only “attitudinal” data, such as feature preferences, usage, and opinions. While important, these types of data cannot be used to prioritize features based on their ability to improve their customers’ profitability. Customer value should be used as a metric to improve voice of the customer research in order to produce data from which these most important insights can be extracted. Analytics: The data analysis helps guide recommendations for moving through each stage. But without including customer value in the data collection process, there is no insight around the price that customers should be willing to pay, which makes building a viable business case extremely difficult. Outputs: At each gate, product managers must deliver an output, usually a standardized document, that exposes key insights from the analytics. These outputs become even more powerful when each potential feature is quantified in terms of the value it would create for customers. Furthermore, when tying that value into what the rough cost of the feature would be to produce, that internal profitability can be extremely useful in prioritizing the development of particular features. Criteria: One of the biggest problems today is that when deciding whether or not to pass through the gate into the next stage, cross-functional communication is hampered by language barriers. Customer value is a metric that everyone understands. 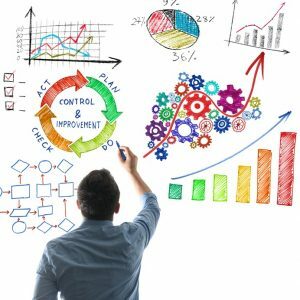 Using it to establish evaluation criteria which all groups – product, marketing, sales, and senior management – can understand and relate to, reduces the cross-functional friction that impedes development. It also allows teams to systematically create higher- and lower-tiered versions of a core offering, a critical flexibility that enables sales to negotiate more effectively and make feature-price trade-offs downstream. Dr. Hogan explains that the idea is not to reinvent the wheel with new processes. Rather, by approaching these four leverage points in a different way using customer value as a metric, better information can be gleaned from these activities. This enables better and faster decision-making at each gate of development, and a profitable product launch becomes more of a reality than a wish. To view our webinars and other resources please visit our Resource Center.